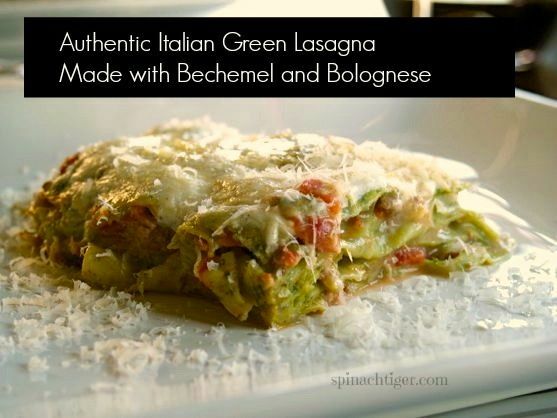 Authentic Green Lasagna adapted from Essentials of Classical Italian Cooking from Marcella Hazan. Mix spinach and flour together before adding egg. You can do by hand or in mixer with dough hook. Knead for about 5 minutes (if by hand). Wrap in plastic. Rest dough 30 minutes. During this time you can make Bêchemel sauce. Rolls out into wide 10 inch strips as thin as you can without tearing. You are going to make six layers of this pasta, but it will be as light as a feather. Cook pasta in large pot of salted water, a few at a time. Blanch for a minute or less, and immediately put into bowl of ice water. Remember to keep changing water with every few pasta strips to keep it ice cold. Then squeeze water out of pasta and dry on clean towels. This is important so pasta will not get mushy. It feels funny to wring out pasta, but it works. Heat milk to a strong simmer. Heat flour and butter together without browning flour. Remove from heat. Add hot milk to flour-butter mixture one tablespoon at a time. Put back on the heat and cook stirring constantly until thick. or the inside layers and top it with bêchemel. Top with Parmesan. Bake until bubbly at 400 degrees in uppermost rack of oven. Marcella suggests no longer than 15 minutes. If refrigerated, cook longer. Left over spinach lasagna noodles (or make extra) are delicious with just the sauce.